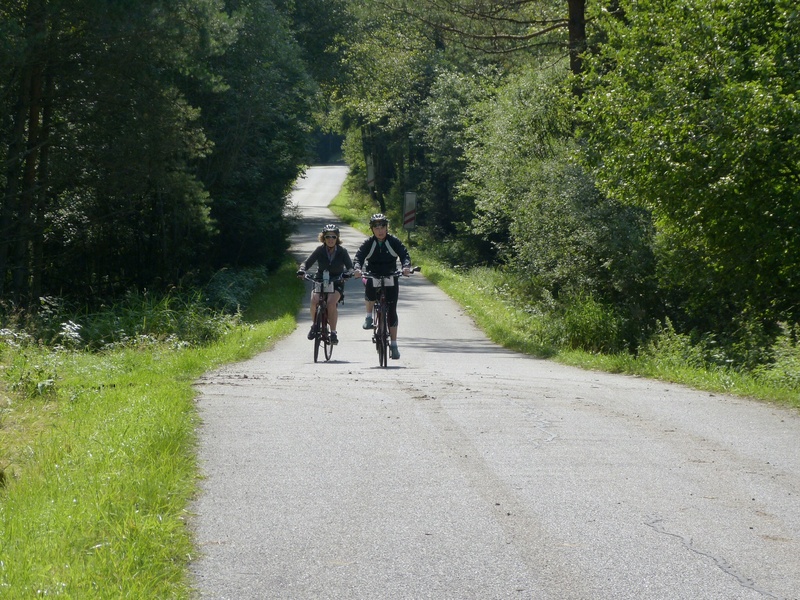 Vermont Bike Trips does an amazing job hiring personable, charming and helpful guides, organizing interesting routes, and making sure that there are options for all skill levels. I’ve been asked how far someone rides on a typical day, and the short answer is as far as you want. For me, the total mileage was 120 miles over 6 days or an average of 20 miles per day. But some days were longer, others were shorter. For example, the first day is always short, because you are getting used to the bike and warming up. That first day,we all rode less than 10 miles. 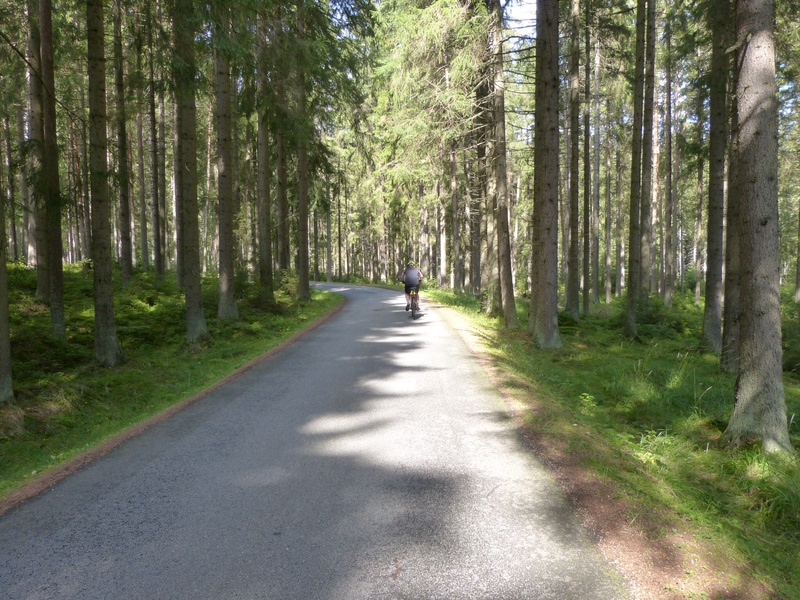 My longest ride was 29 miles, through Sumava, the Czech Republic’s largest national park. It was uphill a fair part of the morning, because we were crossing the continental divide. Beth and Denise put the pedal to the metal and powered up the hill. Fortunately what goes UP must come down, so our ride after lunch was quite delightful. I felt like I was sitting on a motor scooter, zipping through the woods. No pedaling required for a couple of miles–I just held on and coasted. But then we had a few anxious moments when the path we were following was roped off. Did we make a wrong turn? Were we going to have to retrace our wheels (they definitely weren’t steps), except going UPHILL for those “motor scooter” miles? As we pondered our dilemma, it soon became clear. 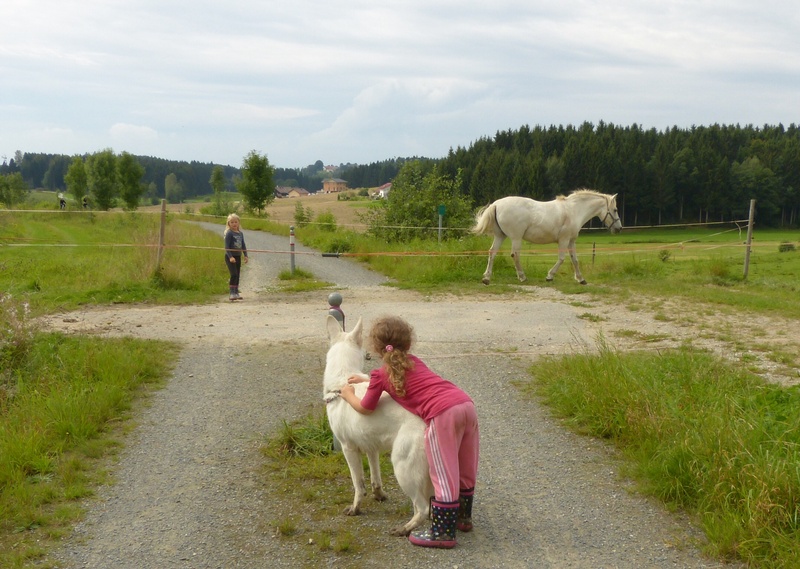 We heard the thunder of hooves, and realized that the ropes functioned as a type of traffic light. By the time I got my camera out, I was only able to capture this last guy. The bike path is also the path for an earlier mode of transportation. If I had been quicker retrieving my camera, you would have seen these guys in action. 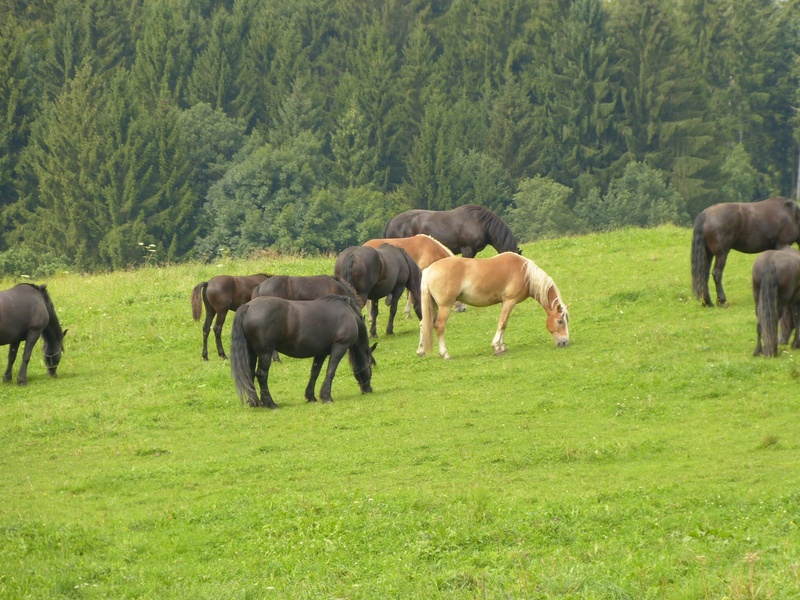 They were quite beautiful, galloping from one field to the other. 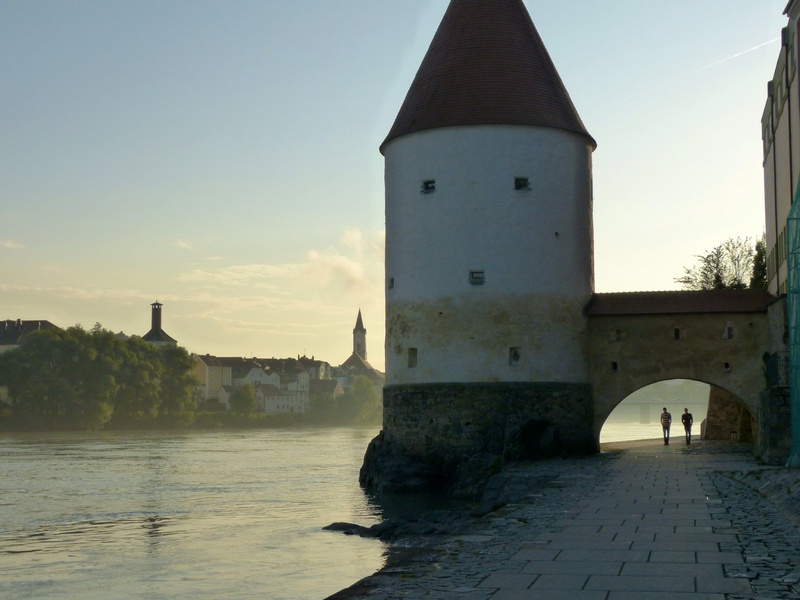 We enjoyed two days in Passau, Germany, a gorgeous little town on the Danube. During. Walk through town, I noticed the playground had a little zip line. You’d walk up a slight incline, hop onto a rope with a little seat type contraption, get a little momentum going and zip across to the others side, where you would smash into a big tire that would then fling you back at least halfway. Maybe the kids could get further…MY best distance was halfway. Sorry, no photos. I waited till it was dark, when the kids had all gone home. 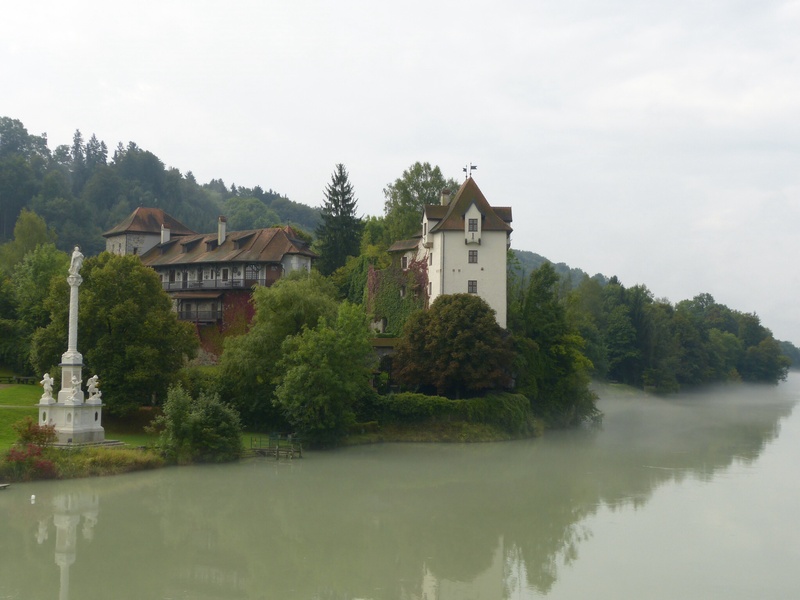 I DO have photos of our ride along the River Inn, to the little town of Scharding. This was the morning that stopped raining just as we headed out. 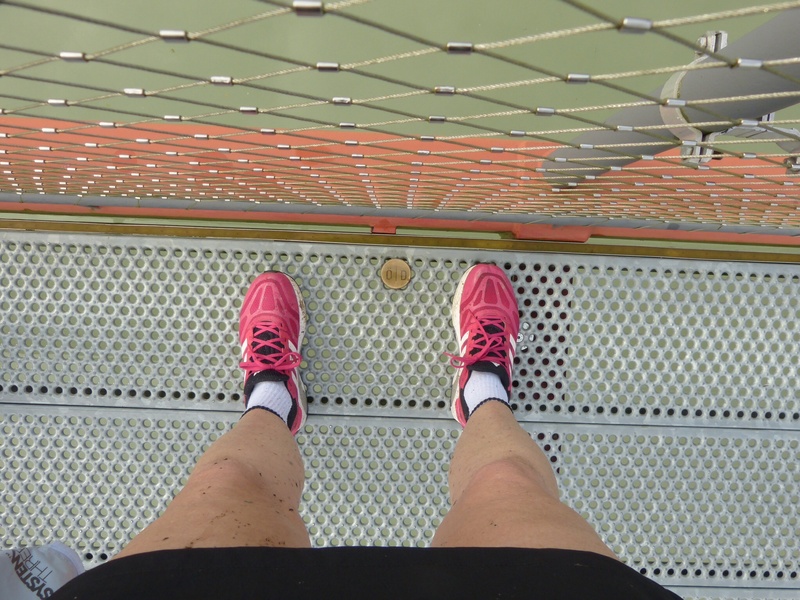 From the look of my legs, you can probably surmise that the trail was just a tiny bit muddy. The bridge between Germany and Austria. I have a foot in each country. 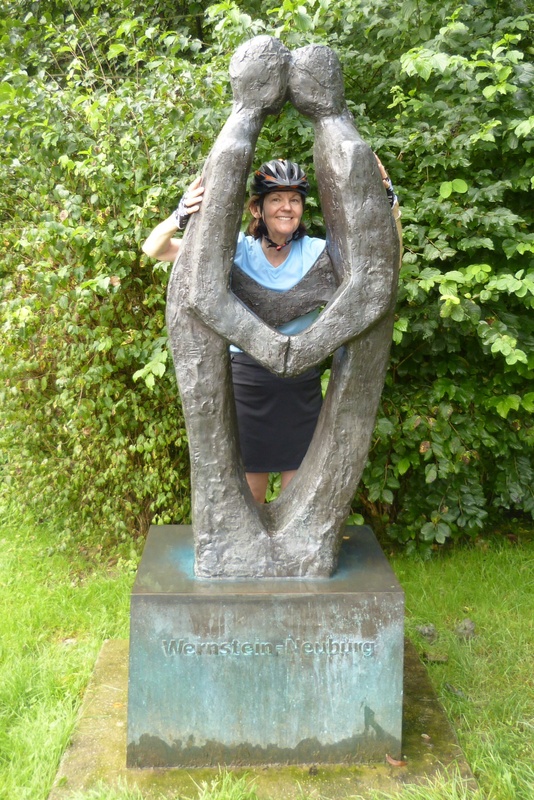 This statue symbolizes the warm, loving feelings Germany and Austria have for each other. The kissing statue. As you can see, I am very much in favor of loving kindness between nations. It was a BEAUTIFUL ride, not too hot, not too cold, with the mist rising from the river making it very scenic. I hope you really like this photo. While taking it, I managed to knock my bike off the path, into the mud. Good thing I had dismounted! One last photo of Passau before I call it quits for the night. I don’t want to run out of my Internet allotment! An interesting, entertaining post, as usual. The photographs add wonderful visual imagery. I particularly enjoyed your explanation of how much you typically ride in a day; I’d been wondering. I’m glad I’m along for your trip.